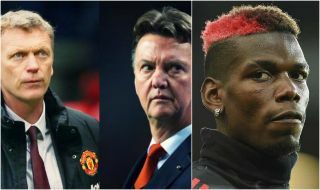 Former Manchester United manager David Moyes reportedly had the chance to seal the transfer return of Paul Pogba from Juventus during his single season in charge at Old Trafford. However, according to the Guardian, the Scot didn’t think it was worth paying Juventus’ £65million asking price for the France international, who later returned to the club for far more than that, joining as their record signing in 2016 for £89m. However, as the Guardian piece suggests, Moyes may well have been proven right after a lack of real impact made by Pogba in his time at United so far. While some blame has fallen on manager Jose Mourinho for failing to get the best out of a clearly talented player, some are also starting to question the 25-year-old’s own attitude and application. Pogba could certainly do a little more than he has for United so far, with the former Juventus man going missing in a number of important games and attracting criticism from some quarters (mostly Graeme Souness, to be fair) for not knowing the requirements of the central midfield position well enough. United fans certainly had a lot of justified complaints about Moyes, but it looks increasingly like he might’ve got this decision right. £65m arguably still doesn’t look worth it for Pogba, never mind £89m.